Vitamin D3 in a potent dose, dissolved in organic coconut oil for optimal absorption. A main source of vitamin D is exposure to the sun. Today’s busy working life doesn’t allow for much time spent outside so supplementing is an easy way to get the vitamin D you need. Your body needs fat to absorb vitamin D. We combined Puori D3 with organic, virgin coconut oil to ensure that you get the maximum benefit. Vitamin D is sensitive to light, which will degrade the vitamin. That’s why we use dark capsules and dark bottles to protect your D3 from exposure to light. Our immune system, muscles and bones need vitamin D to function normally. 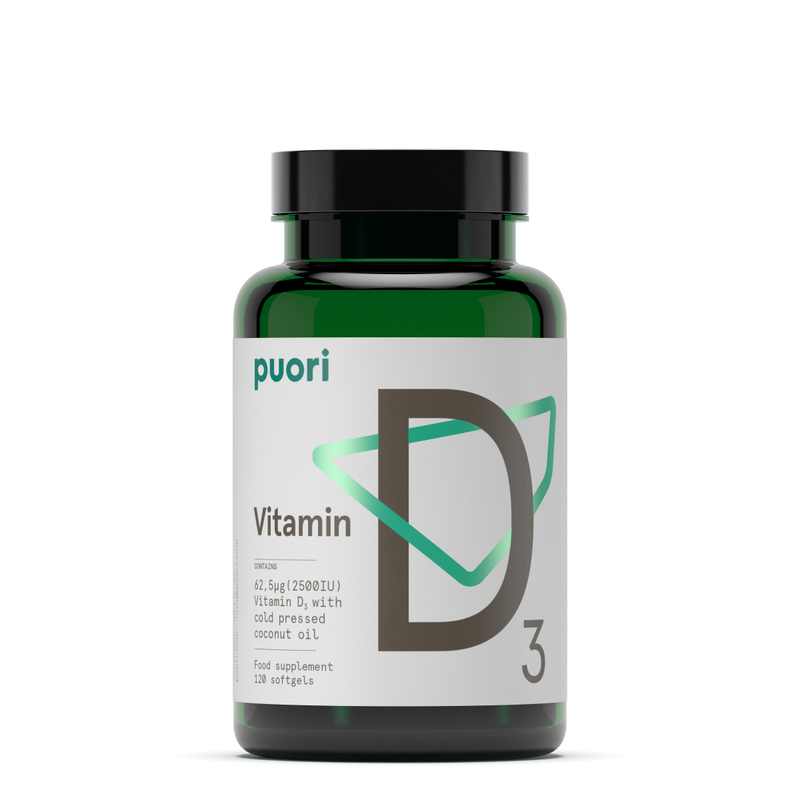 Yet deficiencies of vitamin D are common because many people don’t get enough exposure to sunlight or food containing vitamin D. The good news is that Puori D3 is formulated to compensate for this deficiency. It helps your body to absorb calcium and maintain normal bones. The vitamin D in Puori D3 is derived from purified sheep’s lanolin and is the form of vitamin D3 that the sun stimulates in our body. 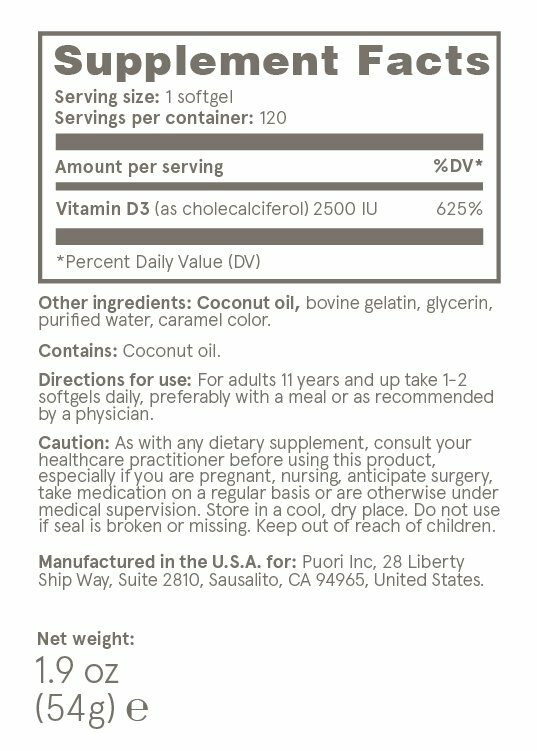 The softgels also contain organic, virgin coconut oil to ensure solubility. When we say it's made for optimal absorption, we don't simply expect you to trust us. 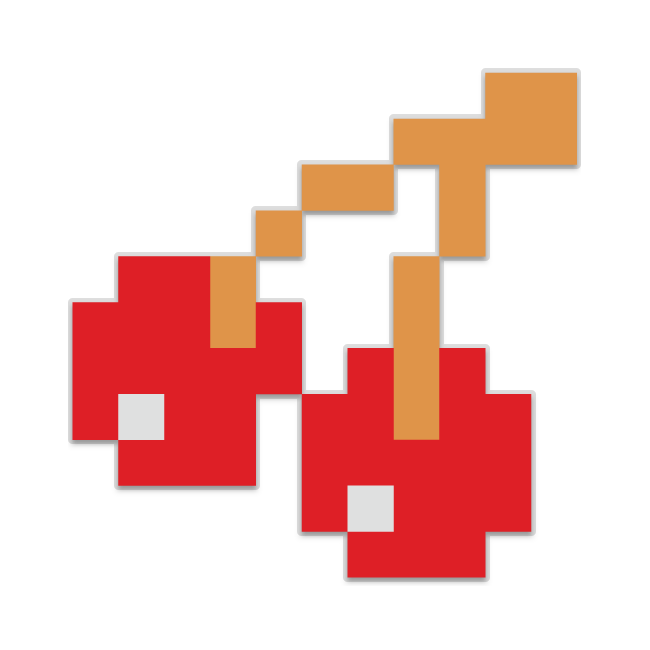 It's one of those things which are easy to say but hard to do, so we get it if you want to try it out first - and we think you should! Get A Week's Worth of vitamin-d for free (shipping $2.99), and we'll even throw in our M3 high-quality magnesium product, and O3 ultra pure fish oil too. Puori Vitamin D3 is a fat-soluble vitamin that is only naturally present in a few foods. Vitamin D is also produced in the body when UVB rays from the sun strikes the skin and triggers vitamin D synthesis. What is vitamin D3 good for? Vitamin D3’s primary role is promoting absorption of calcium and phosphorus, which is critical for bone growth and maintenance. Vitamin D3 also plays an important role in the function of muscles and the immune system. How do I take vitamin D? It is best to take your vitamin D with a meal. How do I store Puori D3? Store your Puori D3 in a cool, dark place as the capsules react to light and heat. Puori D3 comes in dark capsules and a dark bottle to protect vitamin D3 from exposure to light. Does sunscreen affect vitamin D3 absorption? UVB radiation from sunlight produces Vitamin D in the skin, however, UVB radiation also causes melanoma, skin cancer and photoaging. Sunscreen effectively blocks the UVB rays and protects the skin. Therefore, it might still be necessary to take a vitamin D supplement to reach adequate levels. Where is your vitamin D3 sourced from? Can I get all the vitamin D I need from the sun? The amount of vitamin D you can get from the sun alone depends on time of day, geographical latitude, the color of your skin and the amount of skin you expose to sunlight. You produce most vitamin D in the middle of the day when the sun is high in the sky, and the closer to the equator you live the easier it is to produce vitamin D from sunlight. For example, in Florida your body can produce vitamin D most of the year, while in New York or Boston you can’t produce much vitamin D from November through March. The more melanin you have the darker your skin color, which works just like sunscreen regarding UVB exposure.